Giveaway at My Jane Austen Book Club! Today I’m a guest at My Jane Austen Book Club with an excerpt and giveaway for The Unforgettable Mr. Darcy! Giveaway and Excerpt at More Agreeably Engaged! 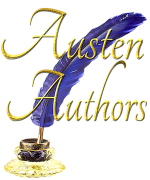 Janet is hosting me for a Giveaway and Excerpt from The Unforgettable Mr. Darcy at More Agreeably Engaged! What happens when Elizabeth wakes up and cannot remember her life? Regency Spies and a Giveaway! Did you know that one of England’s most successful Regency-era spies was a woman? Learn more by reading my guest post at Diary of an Eccentric. You’ll also have a chance to read an excerpt from and enter a Giveaway for The Unforgettable Mr. Darcy!